Matthew’s story of the birth of Jesus includes a quotation from Isaiah, “Behold, a virgin shall conceive and bear a son, and his name shall be called Emmanuel.” We have moved from the gift of promise from the first three weeks of Advent to the actuality of the promise coming to life. “Emmanuel” – God is with us. In first century Palestine, it was the custom for parents to arrange marriages of their children when boys were as young as thirteen and girls as young as twelve. Upon completion of the marriage contract and the establishment of the bride price, the couple were officially and legally bound; however, they often continued to live with their families for one or more years. At the time for the bride to move to the groom’s house, the marriage ceremony took place, with a feast afterward at the bride’s home. Put yourself in Joseph’s place. What feelings and inner struggles might you experience? What is the significance of Joseph’s dreams? (Matthew 1:20-21; 2:13, 19, 22). How do we regard dreams and visions in our world today? How is the messiahship of Jesus defined by his name? What does “God with us” mean to you? As we prepare to celebrate the birth of the one born to save us from the power of sin and death, we see signs of God’s love in birth, in love, in creation, and in the gifts that we receive this season. The role of the Christian congregation, and the individual Christian, is to reflect the presence of God in the world today. From the Fourth Sunday of Advent through the Feast of the Epiphany, the church celebrates the Incarnation – God is present “in the flesh” of human life. God meets us in the midst of our human struggle. The collect for the First Sunday after Christmas Day expresses this well: Almighty God, you have poured upon us the new light of your incarnate Word: Grant that this light, enkindled in our hearts, may shine forth in our lives . . . (BCP 213). 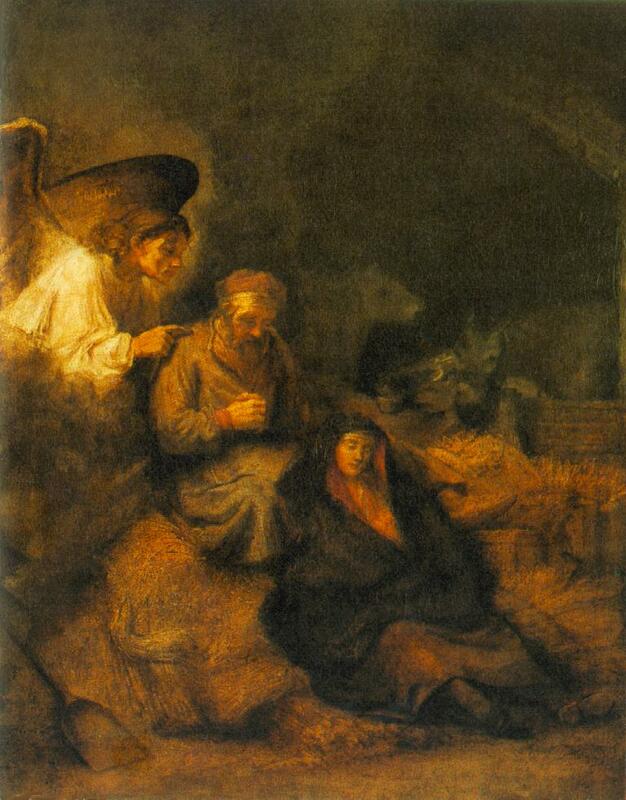 The Dream of St Joseph by Rembrandt (1650-55) This picture is a reference to the dream in which St Joseph was warned by an angel to flee into Egypt so that Jesus might escape the Massacre of the Innocents. The Holy family is shown resting in a dim stable; Mary is protected from the cold by a large shawl which she has also folded round the Infant on her lap so that only his tiny face is visible. Joseph, depicted as a clumsy Dutch peasant, is seen awakening from the sleep of exhaustion, dazed by a brilliant apparition which puts a hand on his shoulder as a sign of heavenly comfort, support and encouragement for the weak. The angel is the source of the warm golden light suffusing the whole group. This entry was posted in Advent, Christmas, Epiphany and tagged Advent, Book of Common Prayer, Christmas, dreams, Epiphany, God, Jesus, Lectionary, Nativity of Jesus. Bookmark the permalink.